Sometimes, things get on top of me. I love to procrastinate, and leave things until the last minute. For the last few weeks, I've had a certain special crochet order to do. But, between my granda being unwell, and having hooking related pains in my hands, I had to rush to get them finished on time. Now that they're finished, and an extra special crocheted Baymax is almost ready for Caelen for Easter, I'm planning a relaxation day. Just me, some music, a good read, and some pampering. I've been letting things slide, you know. Chips on chips on my nails, and my skin is a stress related Sahara-esque spot central. One day this week, Caelen's nana is taking him someplace fun. I'm going to have the longest of hot showers (no bath over here, unfortunately! ), and spend a few hours all my myself. 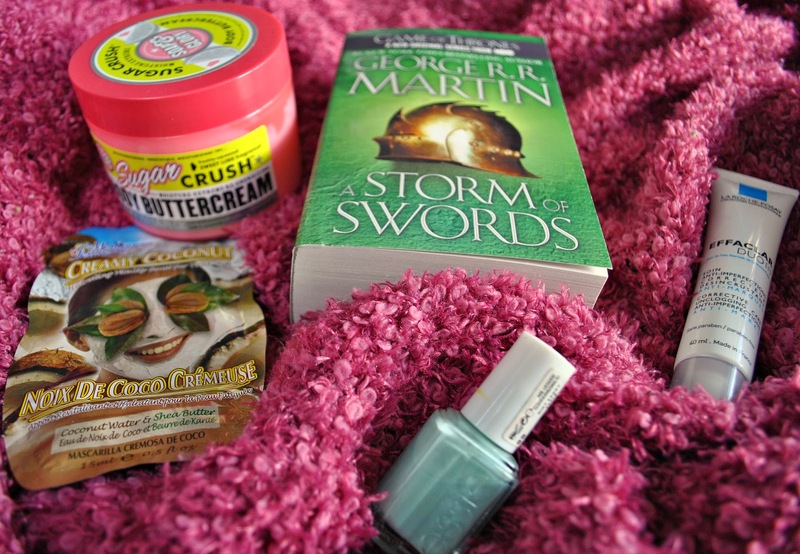 Wrapped up in a fluffy throw and lazing around in my pyjamas, painting my nails and catching up on some Game of Thrones, before I desert the books for the show in a few weeks time! I want to bathe my poor neglected hands in champagne for getting through this difficult and painful time. My budget won't stretch that far, although I do have a champagne infused Vaseline that I can lather them in. I doubt it'll have the same effect, but a girls gotta try! there is nothing better than taking time for yourself, esp for a momma. I hear ya! We'll take whatever we can get! I love relaxing with a good book and a face mask! I'm buying a new book this weekend, I've been debating on jumping on the band wagon with GOT but is it really as good as everyone says, like does it hook you? Thanks, and - I loved this post! Do it! You really won't be disappointed! I find the show a lot easier than the books, I really have to be in the zone to read them. I much prefer something lighter I can dip in and out of when Caelen is around! Thank you lovely, he's doing a lot better these days! I think we all need a pamper session from time to time, but like you said, sometimes not doing anything at all is the best medicine!